KUBOTA EXCLUSIVE SWING-SHIFT PLUS TRANSMISSION: When finding the right speed for your operation, the M6S-111 comes ready for the task at hand. With the 32 speed Swing-Shift Plus transmission, you’ll always be able to find the right gear. 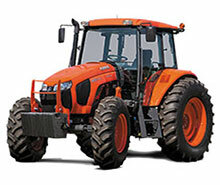 The Kubota exclusive Swing-Shift transmission offers 16 speeds in both high and low ranges, eliminating the need to change ranges while you are working in the field or traveling down the road. Kubota Swing-Shift Plus Transmission’s shift handles have an integrated “de-clutch” button to allow the operator to shift gears without using the foot pedal clutch, reducing operator fatigue throughout the work day.